Who makes my kadala curry? In a divisive time, a tolerant food culture thrives in Mumbai at local joints popular for authentic cuisine. A man from Madurai makes what is arguably the most authentic Parsi food in Mumbai, a non-vegetarian is the head cook at one of Mumbai’s oldest vegetarian restaurants, while a simple homemaker from Bardez runs a popular Goan joint in Mahim. 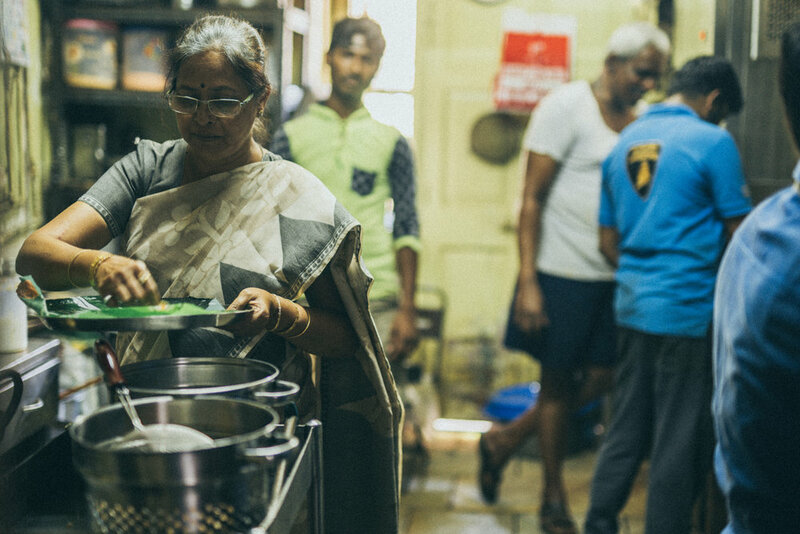 These humble restaurants are often helmed by cooks from unexpected backgrounds and their work preserves a unique culinary culture that defines a city of migrants like Mumbai. We spoke to the cooks behind these iconic restaurants serving affordable, authentic food for generations in the city. Madurai and mutton dhansak have a Murugesh in common. Murugesh who moved to Mumbai 25 years ago started off as a migrant worker in the packing industry. But he stayed back and now calls himself the head cook at Ideal Corner that arguably makes the most authentic Parsi cuisine in all of Mumbai. The food here is accessible and affordable for most locals who crave lagan nu custard and salli boti, amongst other typical Parsi delicacies. Murugesh who has been trained by a Gujarati cook about the nuances of the cuisine, says he learnt for 20 years before he reached his position. His children love his job far more than him perhaps, because as he puts it, he can cook anything for them. But which cuisine does he prefer to tuck into? “South Indian,” he says without missing a beat. You’d never catch him cooking in his own home. “Not even a cup of tea,” he says, his wife does all the work in the kitchen at home because it doesn’t look good otherwise, he feels. However, traditional (sexist) tropes seem to be reserved for the home alone, because for as long as he remembers, Manohar’s only ambition was to become a cook. Passionate about his job, Manohar now has three cooks working under him at this busy Varhadi cuisine restaurant that does steady business from 8 AM till 11:30 PM at night. Although Manohar comes from a staunch vegetarian family, where everyone including his wife wouldn’t dream of touching meat, he himself claims to love non-vegetarian food. “Anything non-veg,” he says, when we ask him what he loves to eat. She comes from a long line of great cooks from Bardez in Goa, but when Savita Karekar moved to Mumbai, she had no plans of cooking at all. Instead, she worked for a radio channel. “This just happened after we started the restaurant. There was a cook here before me, but I didn’t like his food. So I would stay back and teach him a few things but when I cooked I noticed customers would react very positively. So eventually, I ended up doing this full time,” says the lady about her journey as a chef here. Sushegad Gomantak is reputed to have authentic Goan cuisine that has that special touch of home food, perhaps because of Savita’s careful attention to detail. We tuck into a perfectly crisp rava fried bombil thaali and prawn cutlets but she’d rather we have her best dish, tisrya sukke, a slightly tangy and delish clam curry, that’s heavier on the curry than the name leads you to believe. 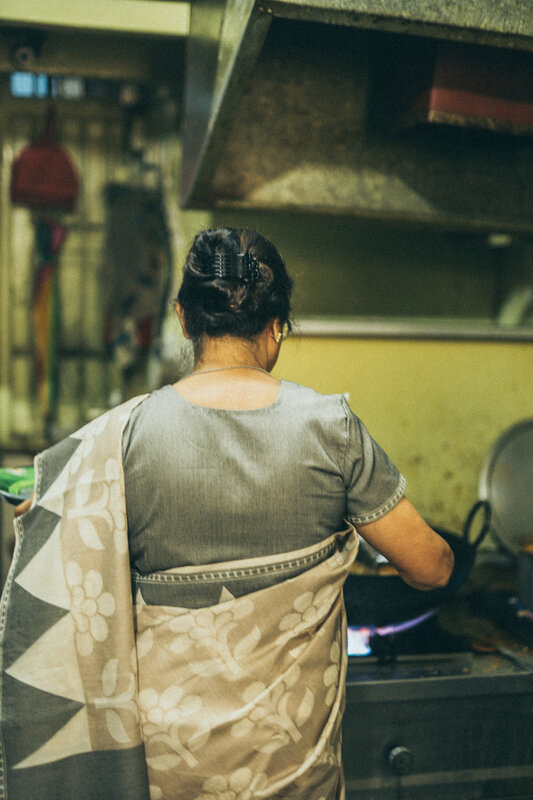 Savita takes obvious pride in her work and works exhaustively from 9 in the morning (cooking for her family), after which she comes to the restaurant to carry on till about 4 PM. Despite this punishing routine, the lady who is now in her 60s does manage to catch her favourite Marathi serials by the end of the day. “But if I wasn’t a cook I wouldn’t be working at all,” she says. People say Neeta Acharekar dresses like this everyday, even at home. ‘Like this’ translates to a beautiful handloom sari, a neat bun with not a hair out of a place and an overall appearance of unflustered elegance. If you didn’t know what she did, she could easily pass off for a headmistress. And Neeta runs her kitchen with the same efficient authority. Acharekar’s Malvan Katta is a family owned operation, with her at the helm and various relatives from their village Vaayri in Malvan who work as cooks and assistants. So how did the restaurant business happen to a homemaker in a traditional and unusually big joint family? The restaurant happened when she realised how well-loved her food was and how much she wanted to bring real Malvani cuisine to people who appreciated it. Madina is packed every morning with people queuing up for its special north Kerala cuisine, which is something of a rarity in Mumbai. We watch as two workers dip their parottas into tea, even as a pair of elderly women in neat floral dresses tuck into a far less frugal meal of muttai curry, kadala curry and appam. The head cook, Sheikh Mohammed recommends, ‘puttu and kadala curry’ for breakfast and we can’t help but eat more than we should. Chicken sukka, beef (buff) and biryani are the most popular dishes for lunch and dinner in this bustling restaurant. Mohammed however isn’t from Kerala, he hails from Bangalore district and trained for 20 years in Madina as an apprentice cook under a senior from Kannur who taught him the details of this sought after cuisine. Working hectic hours from 6 AM to 6 PM, Mohammed has learnt to be practical about the rigours of his profession. People are mostly positive about his food, but what does he do when he receives negative feedback? “You can’t please everyone,” he says pragmatically. Heat rises in oppressive gusts from giant vats of food being tossed and turned by deft wrists in an oddly beautiful dance. Large mounds of slit green chillies and freshly chopped onions leave a lingering, uncomfortable sharpness in the air that makes it hard to breathe. Somewhere else, giant stone grinders make batter almost continuously. It should seem chaotic, but the kitchen in Sneha is clean and efficient with not a single minute wasted by any of the cooks or their assistants. “I started as a fry cook here and an apprentice, ten years of training later I became the head cook,” says Ashok who hails from Gulbarga and makes typical Kerala fare in this famous restaurant. Personally, he loves the fish curry here and highly recommends it. Although he comes from Karnataka, he has always loved Kerala cuisine and perhaps that’s why he enjoys every aspect of cooking here. But how did he find himself in Mumbai? “Necessity made me move to here, I was always in the hotel line but my family has a little farm and if I wasn’t a cook, I’d probably be a farmer, that’s the other thing I know,” he says. What part of his profession does he find most trying? “Chopping onions is hardest,” he says. The tests work because sweet mangoes in various consistencies dominate our table, a thick creamy lassi that the spoon sinks into and a ras that was introduced as a local and immensely popular accompaniment to the puris. Pancham Puriwala has adapted and evolved since it started in the 1840s adding beet puris and local variants to the menu, but it still remains famous for its first ever dish, puri bhaaji. The cooks here are a jolly bunch, ribbing their head cook as he answers us with an endearing shyness. Hailing from a small town in Bihar, Prasad like many others did not set out to be a cook. “I had dreams of doing other things, but perhaps this was my destiny, and now I love my job,” he says. He refuses to tell us what the dream was, instead he tells us about his journey as a cook that started in this restaurant in 1989. So what does he like to eat here, we ask him. “I go home when I have holidays so if I cook even on holidays then what’s the point?” says the busy head cook at a popular south Indian restaurant, when we ask him if he ever cooks at home. Originally from Mangalore, Kuttiah moved to Mumbai 25 years ago. He loves bangda fry and fish in most forms but only when he visits home. In this strictly vegetarian restaurant, he recommends the upma. Kuttaih is very self-assured and efficient but what did he find impossible to do when he started out as a novice, we ask him. This restaurant isn’t the most welcoming of places, you’re meant to inhale your idlis and filter coffee to make way for the next guest who tends to materialise out of thin air the minute you’re done. In a place where time is money, we don’t get to talk too much to Kuttiah but we come away with a sense of a cook who can make perfectly round dosais with his eyes shut. *The restaurant preferred not to be named.